"Very hammy, nicely spicy flavors amplified with a balance of savory ingredients. Garnish with pickled red peppers and chives. Serve with rye crisps for a great party snack that's sure to wow your guests." Combine ham, onion, and celery in a food processor. Pulse on and off until very finely ground, about 1 minute. Transfer mixture into a large bowl. Add Cheddar cheese and mustard. Drizzle in sriracha sauce, sprinkle cayenne pepper on top, and add Worcestershire sauce. Finish off with 2/3 cup mayonnaise and season with salt. Mix together thoroughly with a spatula until smooth and spreadable. Taste; add remaining mayonnaise if too dry and crumbly. Cover the top with plastic wrap and chill in the refrigerator until flavors meld, at least 2 hours. Transfer ham spread to a serving bowl. 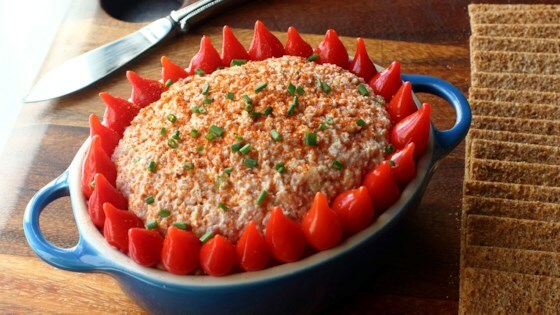 Watch Chef John whip up this unique party dip or sandwich spread. Use any cheese and the hot sauce of your choice. OK haven't make it yet, but I definitely will! Looks amazing and very similar to a recipe I have.